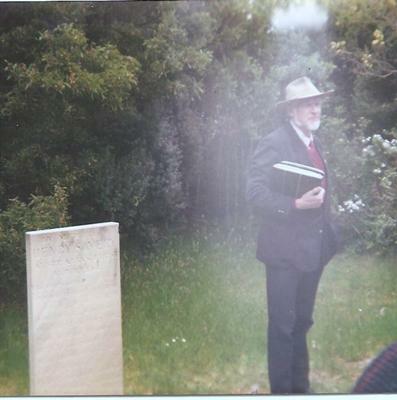 This picture was taken by my mother-in-law in 1994 at a cemetery called the Isle Of The Dead. This place is situated a few hundred metres off Port Arthur, a former penal colony and place of much misery and suffering during it's time. What's also notable about the Isle of The Dead is that many of the graves hold up to four or five bodies and are unmarked. She had one frame of film left and was eager to finish the roll before going home so she took a picture of the tour guide. This was the result. Looks like a flaw on the film to me. It looks like a cloud white sun light shining down!! !